Topic: I have a spare ten gallon tank and was thinking about devoting it to betta fish. Does anyone know the life span of a betta fish? It seems like I remember them dying so quick but maybe something wasn’t right in order for them to live life to the fullest. Anybody know how long they live on average or what their life cycle is? Thanks for the help. Amazingly, betta fish live for 2 to 3 years on average. Maybe 5 years in really good living conditions with the best fish care possible. The common misconception that these fish don’t live for a long time is due to the fact of tank and living variables. These fish of been pretty popular in today’s society just because of what they are known to do as far as fighting. Some people actually get into fighting the fish but I do not agree with that. You can go to any Walmart and find these fish in the fish section for sale for very cheap. What a lot of people do not know as well as the fact that when you buy these fish they are possibly already one to two years of age. The reason they are so old is because they need to bloom into-age before they look appealing to the public to buy. A betta fish is going to live a lot longer in a larger tank due to the fact that it will have less anxiety from switching waters on a weekly basis. And a smaller tank you have to change the water more frequently and when that happens the fish gets very stressed out and gets anxiety and that deals with its life longevity. With a larger size tank or aquarium you will have to change the water far less and that will create less anxiety for the fish and changes in breathing water. It is said that the life expectancy goes down to an average of 2 to 3 years in a small bowl versus the 5 to 8 and a large aquarium. These are not set numbers but just averages that are based off of facts. These types of fish need actually pretty warm of water compared to other freshwater fish. I would say on average or water needs to be of temperature 75 to 84°F. If you’re going to push the limits with how Cold water is it’s more than likely later fissured is going to die because it doesn’t make for the best environment for them. Just go buy a thermostat and little heater and check the water on a weekly basis because your heater should average out the entire tank. You can buy that heaters for like $20-$30 and they’re very easy to maintain. You’re going to have to buy some necessities for your tank but it’s going to make the best living standards for your fish and they will live a lot longer. When using regular tap water out of the faucet there going to be many additives to it like chlorine and such. You need to remove the stuff for the fish because it is not designed for these chemicals and they make a lot of cheap products I can make your water safe for your beta fish. Your filter will not remove chemicals from your tap water. PH is kind of hard to understand but it’s basically amounts to the acidity level in the water. You’re going to want around a pH level of seven for your beta fish. It is very cheap to buy little strips of paper that you dunked under the water and it tells you what level of pH your tank water is at. Then to change the pH level of your water you can buy additives that help bring it up and down and levels. These type of fish like pellets but there are better food designed just for betta fish that are called worms or dried worms. Is there a separate container only designed for beta fish and no other fish. These are going to smell a little bit different than palettes but they are going to be a lot better for the fish because that’s what they love to eat. You also want to feed your fish at the same time every day and the same amount because it will be used to it and get on a schedule that will be very healthy for them. You can also bring a lot of entertainment to their life by adding other fish and making sure all those other variables are there for them to be as happy as possible. People also use a mere every once in a while to bring some enjoyment because they do not know what they look like so they think it is another fish in the tank for a small time amount. Do not leave the mirror out too long but it brings a little enjoyment to the fishes life every time. Following these variables will help your fish to live the longest life possible and also be very happy. Sometimes it’s a matter of lock if your fish live a longer life than others but you can help by giving it all of the best variables to live its best life possible. 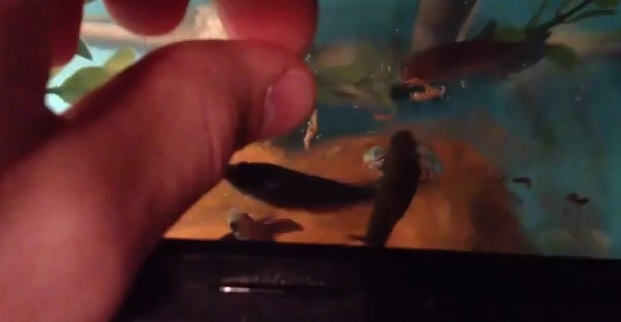 The #1 Betta Fish Killer is Tank Size! 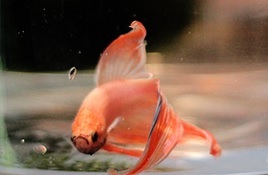 Question: Hi mate, for Christmas this year i wanted to get a betta fish, only thing is i cant afford a big tank, there is a 9 liter tank which i can afford that also comes with all the essentials (conditioner, food, heater etc.) My question is, should i spend that extra amount of money and buy a larger tank, or would it be okay to keep a betta fish in that 9 liter tank. thanks mate. I’m guessing this is the tank your talking about? (image below) It seems to be one of the more popular setups and easily found at walmart. I think there is nothing wrong with it, and you even get free shipping if the order is over $40 so.. seems legit. If you decide to use a small 3 gallon jar like this you want to take some precautions before just putting your Betta in the tank full of water right away. *SIDE NOTE: might I add that a 10 gallon actual fish aquarium is only $12.99. Most people think the fish needs gravel on the tank bottom but that’s not true. Your aquarium will stay much cleaner without gravel and you can set the tank on some colored paper so it looks cool from the inside. They have actual gravel paper that you set the tank on so it looks like there is gravel through the glass but there actually isn’t gravel. The tank stays much cleaner without gravel. The water that comes out of your faucet has chlorine and other bad things for fish in it. Any basic water conditioner will work. You need to read the instructions on the back of the container and follow directions. It will state “add so many drops per gallon of water.” ALL WATER that goes in the fish tank needs to be mixed with water conditioner before it goes in the tank. Fish die from chlorine all the time. Add Some Decorations to Your Tank Too! This is the crucial step that most beginners don’t know and skip. In order for a tank to do well, the water needs “beneficial bacteria”. These are bacteria that work with the fish and help make the water levels more safe for fish. Think of it as a “living ecosystem” inside your tank. The #1 reason why fish die is because their owners are unaware of this bacteria. I don’t want to make it more complicated than it is… so let’s keep this simple. We want to buy a decoration or plant that is already INSIDE of a healthy tank. This beneficial bacteria lives on decorations and such. We want that bacteria in our tank and need it! At your pet store, buy a fake plant, piece of driftwood, a real plant, or a bigger rock.. we just need I transport some of that bacteria from a healthy tank to our bowl. Don’t get me wrong, your fish could do fine without this possibly but this is a NECESSITY to a healthy aquarium. Listen carefully. Do not just dump your fish into the tank of water. The new water is way different than what the fish has been living in so you need to introduce the fish slowly to the new water. To do this, add a 1/4 cup of the new type of water to the jar your fish came in. Add 1/4 cup every 20 minutes until the fish has gotten use to the new water type. Changing the water type on your fish puts stress in their organs and body. Fish die from stress very easily. Put the two together! I don’t mean to get nasty but people skip this step and email me when there fish is dead… “I mean come on RigHT? !” Ok I’m good now haha. Now that your fish is introduced to the new tank with a piece of decor from another tank (with beneficial bacteria) you are good to go. Have fun with your Betta because they are awesome! You can relate back to some of my videos if you want some more direction. i live in Australia and as far as can tell there is no wall mart here, i looked around and found a 28 liter tank (a bit over 7 gallons) for the same price!!! my new fish is living happily in his tank with all necessary equipment, however i did not add him in the way you have told me as i have just read this page. the water quality in Melbourne is one of the best in the word, and i added the necessary conditioner, so i am not too worried. other than that he seems to be great and enjoying life. he also loves his many hiding spots i have added. My female’s name is Tricia and I love her. Thnk-you very much Chris, you have been a lot of help.